The Maple Street Mansion has long been thought by Carrollton residents to be haunted by several spirits. The most prominent spirit of these is named Eugenia. Back in the early 1900s, Eugenia, who was 18-years-old, was said to have jumped off the third floor of The Mansion. Apparently, she was madly in love with a young man of which her family did not approve. One night Eugenia's brother got into a fight with the young man and her crush died. Heartbroken, Eugenia jumped to her death that night, but her spirit never lifted to Heaven. Carrollton Residents have claimed to have seen a women walking back and forth on the top floors of the Mansion as they pass by the Maple Street establishment. Bob Uglum, owner of the Mansion, has also had experiences with spirits in his restaurant. One morning, Uglum heard a noise in his office. "So I turn around expecting to see someone behind me, but there was nothing. I didn't think anything of it at the moment, so I went on with my day," Uglum said. Later, Uglum felt breathing on his neck. "Of course I get a little freaked out by this. But I am also thinking I am crazy. There is nothing breathing on my neck. "Well, sure enough, when I looked up, there was no one in the room but me," said Uglum. There have also been several other sightings of ghosts at The Mansion. 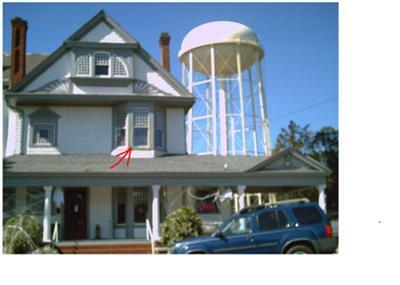 A couple that had just moved to Carrollton was eating at The Mansion one day a few years ago when they claimed to have seen a little girl in a big, white dress walk across the room and look out the window. "After that the couple said she just disappeared…I have never seen someone as scared as that couple was," said Uglum. In 1985 there was a séance performed at The Mansion by a UWG professor and her psychology class. The professor had Jan Anson, author of "The Amityville Horror", as a guest speaker that week. They asked Uglum if they could perform a séance in his office at The Mansion. He agreed and the séance was performed. "It was pretty convincing," Uglum said. "They had described Eugenia perfectly. They also felt the presence of an older man and a little girl. They all seemed to Anson as being kind in nature (except) the older man," said Uglum. Since then, there have been only three other instances where customers claim they have seen a little girl or a woman. However, one server quit after an apparent sighting. Mary Eugenia Mandeville, oldest of the five children of Leroy Clifton Mandeville and Carrie Louise (Richardson) Mandeville, was born 2/16/1878. Her marriage to Mr. Homer Watkins, who was of Atlanta and from a prominent family in Carroll County, took place 11/1/1914 at her home, the LC Mandeville home (aka The Mansion) on Maple Street. Eugenia died 5/22/1915. According to The Atlanta Constitution 5/23/1915, Eugenia passed away "after a lingering illness of several months. Mrs. Watkins was a finely educated and accomplished woman, deeply beloved wherever she was known, and peculiar sadness attaches to her death by reason of the fact that she was a bride of only a few months…She became seriously ill shortly after her marriage, and finally when there was no longer hope for her recovery, she was brought to Carrollton on Sunday, May 16 to spend her remaining days in the home of her parents." Eugenia is buried in the Carrollton City Cemetery in the Mandeville plot, along with several generations of the Mandeville family. Her husband is not buried beside her - he remarried 3 years later on 3/23/1918 to Lois Mundy in Polk County, GA. He died 2/10/1942 in Rockmart, Polk County, GA.
Has anyone heard the story that since they can't sell it they are going to have it torn down??? I Really hope this is just a rumor. The listed story about Eugenia is wrong and I got her last name wrong, it was Mandeville-Watkins, not Smith. In my research she was Born on Feb. 16, 1878 and died on May 22, 1915, that would have made her 37yrs. old. She was married to a Homer Watkins. She had an aunt also named Eugina Mandeville. That aunt was married to Edgar Hugh Long and she was born on Jan. 27, 1854 and died on Feb. 27, 1881 that would have made her 27yrs. old. So both women were over 18yrs. old and both were married. The story I heard was that one of the Eugenia's had cancer and chose to end her own life instead of suffering. Though that story may be true, as both died young, I could find no proof of it. Suicide was never talked about and such a death would have more likely been said to have had other causes. That's my picture! Taken in mid-October 2008. It was posted on West Central GA Investigators of Paranormal Activity (W.C.G.I.P.A. )'s website. That website was hacked sometime in 2011-2012 and would re-direct to the Tennessee Web-Ring. (Don't know if the hacking was related to TWR or not.) Anyway, sometime after my own computer crashed and I thought I had completey lost that picture. It's nice to see that it's still out there though. Now for a little more detail on the picture... If you can zoom in or blow it up it looks like a young boy standing in the window. The problem with that is that the "arms and body" are nothing but 1/2 window, horizonally slated wooden shutters (I went back and looked). There is a vertical gap in the shutters on both sides of the middle - accounting for the arms & body look. The interesting part is what appears to be the head. I could not acount for that. Blown up it looks to be the head/face of a 12-14 yr. old boy. The only picture I was able to find of Eugina Mandlevile-Smith (the resident ghost) was of her when she was about 12-14yrs. old & her hair was either pulled back severly or cut so short that she appeared to be a boy wearing a dress! I still wish that I could find my other pictures somewhere. The elderly mans name is Jack Witerka. He was killed in the house that was added on. His wife Elaine & his young son planed it . She shot and killed him.